The Purely Clear Neutral Concealer is wonderful for covering unwanted facial pigmentations and can be used with or without wearing a foundation. The Purely Clear Under Eye Concealer is a perfect solution for those dark under-eye circles. 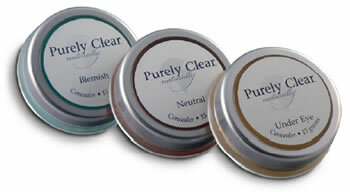 The Purely Clear Blemish Concealer is ideal for covering those unwanted blemishes and neutralizing the red skin tones. Our concealers should be applied with the Concealer Duo Brush. Neutral Concealer - Prunis dulcis (Sweet Almond) Oil, Titanium Dioxide, Apis mellifera (Beeswax), Palm Christi Oil, Butyrospermun parkii (Shea) Butter, Iron Oxide, Theobroma cacao (Cocoa) Butter, Mica, Simmondsia chinensis (Jojoba) Oil, Limnanthes alba (Meadowfoam) Oil, Oenothers biennis (Evening Primrose) Oil, Persea americana (Avocado) Butter, Zinc Oxide, Tocopherol (Vitamin E), Rosa mosqueta (Rosehip) Oil, Aloe barbadensis (Aloe) Oil, Rosmarinus officinalis (Rosemary) Oleoresin, Azadirachta indica (Neem) Oil. Under Eye Concealer - Prunis dulcis (Sweet Almond) Oil, Titanium Dioxide, Apis mellifera (Beeswax), Palm Christi Oil, Butyrospermun parkii (Shea) Butter, Theobroma cacao (Cocoa) Butter, Iron Oxide, Simmondsia chinensis (Jojoba) Oil, Limnanthes alba (Meadowfoam) Oil, Oenothers biennis (Evening Primrose) Oil, Persea americana (Avocado) Butter, Tocopherol (Vitamin E), Rosa mosqueta (Rosehip) Oil, Aloe barbadensis (Aloe) Oil, Zinc Oxide, Rosmarinus Officinalis (Rosemary) Oleoresin, Azadirachta indica (Neem) Oil. Blemish Concealer - Prunis dulcis (Sweet Almond) Oil, Titanium Dioxide, Apis mellifera (Beeswax), Palm Christi Oil, Zinc Oxide, Butyrospermun parkii (Shea) Butter, Chromium Oxide, Theobroma cacao (Cocoa) Butter, Simmondsia chinensis (Jojoba) Oil, Limnanthes alba (Meadowfoam) Oil, Oenothers biennis (Evening Primrose) Oil, Persea americana (Avocado) Butter, Tocopherol (Vitamin E), Rosa mosqueta (Rosehip) Oil, Aloe barbadensis (Aloe) Oil, Lavandula officinalis (Lavender 40/42) Essential Oil, Melaleuca alternifolia (Tea Tree) Essential Oil, Rosmarinus Officinalis (Rosemary) Oleoresin, Azadirachta indica (Neem) Oil.